touristplacesinindia offers complete information on the city of Rajkot, Tourism in Rajkot, Travel to Rajkot, Hotels in Rajkot, Rajkot Hotels, Rajkot Tourism, Rajkot Tours, Tour Packages for Rajkot, Places to stay in Rajkot, Visit Rajkot, luxury hotels and budget hotels in Rajkot. Rajkot is an important town of Gujarat where Mahatma Gandhi spent the early years of his life. In the present days it is a rapidly growing town of Gujarat and plays a crucial role in the economic development of the state. This town is quite renowned for its Bandhani sarees, mirror-work, patch work, bead work and silk embroidery works. Rajkot also ranks high among the most visited destinations of Gujarat and thus tourism has gained immense impetus here. Embark on a tour to Rajkot and explore the rich culture and tradition of this town that has associations with the royal families. There are many tourist attractions in Rajkot that are worth catching a glimpse and some of which are Kaba Gandhi's Gate, Watson Museum and Library, The Rajkumar College, Rashtriya Shala and Jagat Mandir. Besides, Rajkot city in Gujarat is also well-known for its diverse culture and you will come across many religions here living in peace and harmony. Rajkot is also an important hub for the performance arts and music and you can find a number of venues that organize the Gujarati plays and music concerts. The people of this town are quite affable and hospitable. You can visit Rajkot from October to March because the climatic conditions during this period are generally pleasant. Rajkot offers a number of lodging options for the tourists where they can put up according to your budget and preference. There are a number of luxury hotels that are located in Rajkot. The well known among these are Hotel Kavery Rajkot, Hotel Royal Inn, Hotel Silver Palace, Hotel The Grand Regency and The Imperial Palace. Similarly, you will also find quite a few economy hotels and a good number of budget hotels that are strewn all over the town and offer fine facilities and services. Rajkot is easily accessible by air, rail and road transport. The domestic airport at Rajkot connects the town of Mumbai and other cities of India. There is also a railway station from where you can reach Delhi, Mumbai, Cochin, Coimbatore and Bhopal. The road transport is equally convenient and you can reach the city by the state transport buses that are available from cities such as Mumbai, Bhuj, Bhavnagar, Una, Mount Abu, and Udaipur. The most famous festival in Rajkot is Navratri during which the famous Garba dance is performed by the people that commences from midnight and continues till dawn. Besides, the famous Janmastami mela (fair) is also organized that lasts for a period of five days. 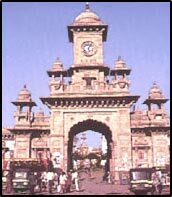 Know more about Rajkot by clicking on to the site touristplacesinindia.com, which offers valuable travel information on Rajkot.